Satellietgroep hosts 3 artist in residency spaces at DCR Gueststudios in The Hague to facilitate short and long term cultural visits and workperiods in The Hague. 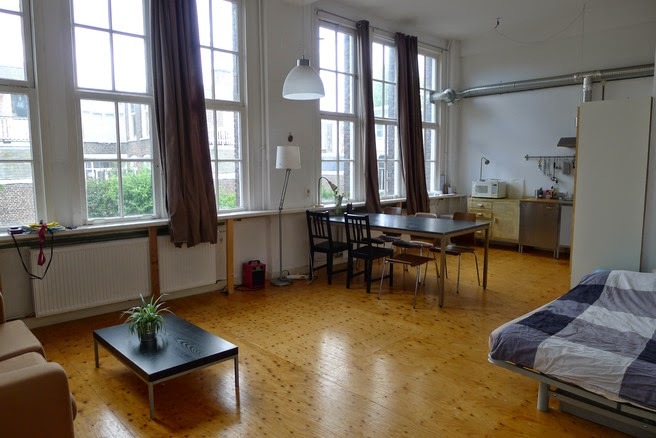 DCR Gueststudios are located at De DCR and near the center of The Hague, on biking distance from the sea, Gemeentemuseum, Stroom, Mauritshuis, etc! Each studios space can be rented separately by 1 person (in special cases max 2 persons) and each includes a fully equiped private kitchen, shower and toilet. Clean sheets and towels are provided. With shared washingmachine and vacuum cleaner. Use of bikes and weekly cleaning are optional. Proposals/applications are open to artists/curators/scientists/philosophers/writers/artists initiatives/cultural organizations. Minimum stay of 3 days, ranging to a month or even longer are possible and at different rates. We are open to additional requests for introductions into cultural networks and/or presentation opportunities. Please check the calender for availability and feel free to contact Satellietgroep and our DCR Geuststudios coordinator/artist Lotte Bosman at dcrgueststudios@gmail.com if you have questions regarding the DCR Gueststudios. De DCR is a cultural incubator that also houses 35 permanent studios for artists and designers, including the studio of Satellietgroep, Zaal 3 - laboratory for Performing Arts of Theater aan het Spui, sound studio Loos, Cloud Danslab and exhibition space Nest. Satellietgroep programs 3 DCR Gueststudios at De DCR. Satellietgroep (The Hague, 2006) is an international artist run network that explores through artistic research how the sea and waterways influence cities, people, communities and environments, and vice versa, the way mankind influences the sea, coastal transitions and climate change. Satellietgroep hosts artists in residents for artistic fieldwork, connect with locals and experts and develop new concepts and works that reflect the resilience of coexistence of man and water, in past, present and future. Long term projects are Badgast - artist in residency program at The Hague/Scheveningen (2009-2014) and Now Wakes The Sea, the international exchange residency program in collaboration with international cultural partners (since 2012 in Turkey, Moldova, Georgia, Lithuania, Russia, New York City and UK). Since September 2014 we program artistic research on the Zandmotor in collaboration with Villa Ockenburgh/Locatie Z (2014-2015) and international collaborations with Nida Art Colony (LT), NCCA St.Petersburg (RU) and LMCC (NYC).